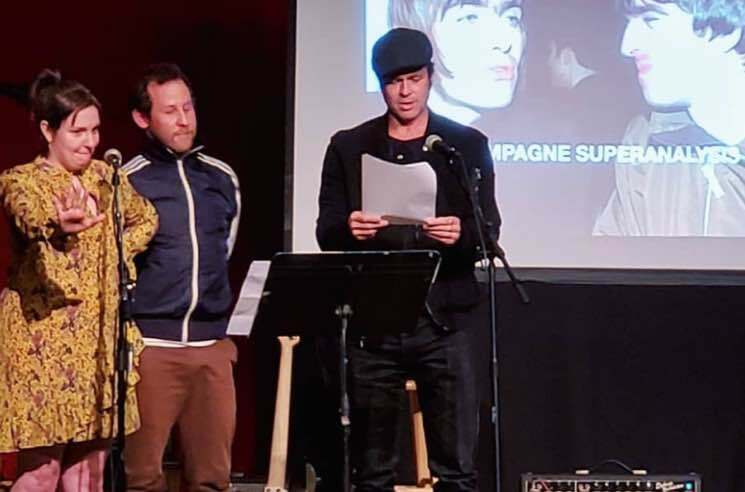 As promised, Lena Dunham and Ben Lee teamed up to psychoanalyze the Gallagher brothers after the former watched the Oasis documentary Supersonic earlier this week (November 18), and now footage from the live event has surfaced. It featured an unexpectedly star-studded list of guests, including Brad Pitt, who gave the crowd a vulgar introduction that would make Noel and Liam proud. He took the stage at Largo in Los Angeles, and told the crowd: "Let's do this, you cunts." Dunham read a disturbing love letter to Liam, while others opted to go the interpretative dance route, writhing onstage to "Wonderwall." See some of the highlights from the bizarre "psychological exploration" below.